← AM I A FIREMAN YET? Over sixty years ago a five year old, wild born elephant named Shirley was captured in her native country of Sumatra and purchased by the Kelly–Miller Circus. Soon thereafter, baby calf Jenny arrived at this same circus. The bonding between these two was immediate, with Shirley quickly assuming the role of surrogate mother. Sadly the two were separated at the end of that first year. Shirley spent most of her life traveling the world entertaining circus audiences. In 1975 at age twenty-eight, she was attacked by another elephant while performing for the Lewis Brothers Circus. Her right hind leg was seriously broken, but because it was not set properly, it healed poorly. Regardless of an injury that caused her pain and awkward movements, Shirley was forced to perform in the circus for nearly two more years. Unfortunately that was not the end of Shirley’s saga. During the last of her performance years, while her circus ship was docked in Nova Scotia, a fire broke out in the engine room. The ship sank, killing two animals. Fortunately Shirley was rescued, but not without further injuries. If you look carefully at her photo, you can still see a large missing chunk from her right ear and several scars on her back, side and feet. When no longer fit for circus performances, Shirley was sold to the Louisiana Purchase Gardens and Zoo in Monroe, LA. 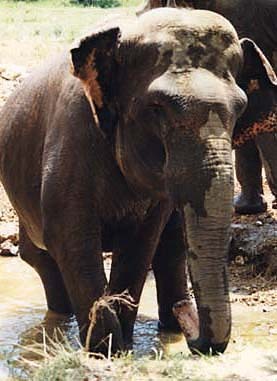 Although normally female elephants live in groups, for safety concerns related to her injuries, Shirley was kept apart and lived alone at the zoo for twenty-two years. The Zoo was generous to Shirley by providing her with a loving environment, but the time came when they felt Shirley could lead a healthier life in a natural habitat. That is when the Zoo contacted The Elephant Sanctuary located in Hohenwald, TN. Jenny had an equally sad until . . . Please CLICK and LIKE my new Author Page. Posted on November 13, 2012, in Tales2Inspire, Tales2Inspire Contest, TALES2INSPIRE WRTERS CONTEST, Words to Inspire and tagged "SHIRLEY AND JENNY", "the elephant sanctuary", author, ELEPHANTS, Lois W. Stern. Bookmark the permalink. 5 Comments. So glad you enjoyed Part 1. I was blown away by this story and expect you will be too. Thanks for being loyal fans. An enjoyable story looking forward to the next chapter. What a sad tale of an elephant’s life that was supposed to turn out beautiful if left in natural habitat. Can’t wait to see how Jenny’s story unfolded. Luv this, its touching and inspiring. Hang in there as the story gets beautiful – eventually. Tomorrow I’ll post Part 2. While you are there, I would be so appreciative if you would click on the LIKE button at the top of the screen. And if you have some interesting info to share, don’t hesitate to run it by me. This is a two step process which I don’t quite understand this myself, but they do have some convoluted ways!